Dark Social, a term coined by Alexis C Madrigal in 2012 to describe the web traffic which comes from sources which cannot be traced through web analytics. Emails, texts, messages and forum posts for instance. When someone copies and pastes the link from a website into communication channels like the ones mentioned above. It is called sharing via Dark Social. The link thus pasted gets viewed by many friends, family and colleagues and is said to carry much more weight than a Facebook post or a Tweet. It is logical to assume that most people do not want to share too much over the social channels. An overwhelmingly large percentage of web users shy away from revealing too much about themselves, their tastes or choices. The dark social has come to be recognized as an effective manner in which content can be narrowed out and sent across to a select audience. Dark Social is one of the most valuable sources of social insights and intelligence because its represent the genuine interests of sharers and their targeted recipients. 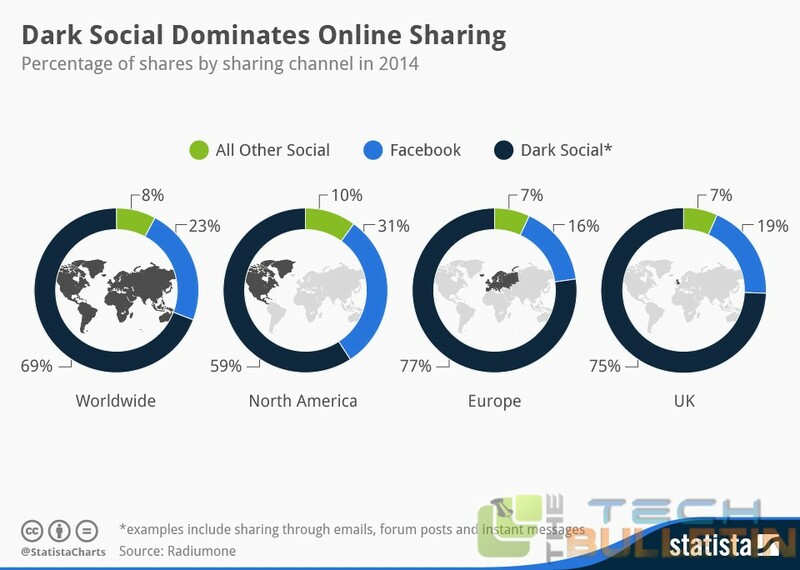 For each Dark Social share, the content and people it’s being shared with are selected for a specific reason. This is a very different data than that collected from social networks, where sharing centers around what an individual considers okay for public examination. It generates high volumes of valuable real time data – which can be then segmented and activated at any given point of time when the consumer is showing genuine interest and intent. Dark Social presents an exciting opportunity to advertisers and publishers. People will be sharing with a specific individual or small group; you are using that content to tailor your image in the eyes of just those people. 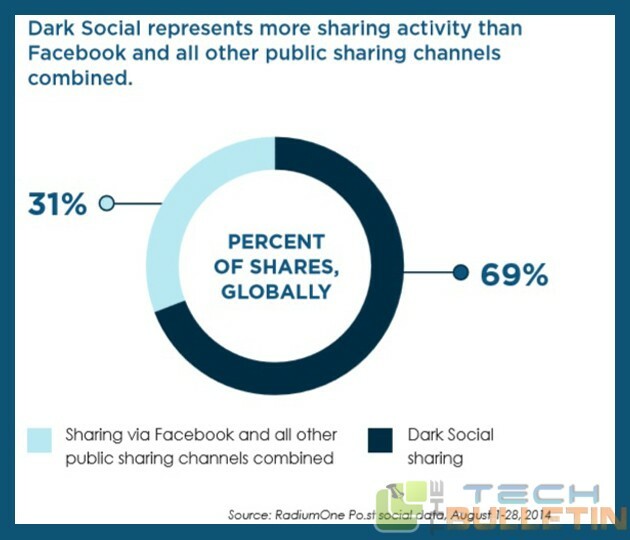 Dark Social Sharing can have a massive impact on how corporate marketing messages will be shared worldwide, which is three times bigger than the size of Facebook sharing. Acting on Dark Social presents huge opportunity for brands to improve their ROI from their social media and digital marketing investments. What is clear to all corporations and their key brands is that their focus on light social sharing has a value, but there is a whole new stratum of potential levels of engagement across dark social. Those brands can factor dark social into their marketing campaigns will be able to make much deeper and long lasting commercial relationships with their customers. However among consumers who do share content, 93% of them tend to use dark social channels and 69% of all sharing activity online actually takes place through dark social which is a huge number of content compared to Facebook sharing of 23%. Dark Social is not limited to desktops, as mobile devices become more important to consumers and advertisers alike, more internet users are sharing their content thru dark social on their smart phones and tablets, with 36% doing it globally. Some consumers become more privacy focused, and as they wonder what advertisers are doing with their data, there is a implication that perhaps some of them try to avoid sharing too much about themselves on social networks, especially Facebook, which basically collects as much data as possible on its users. On one hand, there is some evidence to debunk that – there are users out there who purposely share links on Facebook to maintain an archive of what they’ve shared, and they’re fine with sharing their personal data, if that’s the trade off. There are a few ways of using dark social to track what readers are doing, and while it may not be as a complete picture as social sharing. The topics discussed in Dark Social channels are typically more one to one in nature such as arts and entertainment, careers and travel. Whereas, in social channels likes Facebook, topics discussed are Pets, Family, Parenting and Real Estate. Another interesting point in Dark Social, as people get older, they share more and more via dark social. However it is prevalent in social channels, young people use them a lot. Dark Social is more honest, with less of a filter on it. It provides richer and more accurate information for advertisers and brands to learn from, if they can access dark social. It’s hard to act on what you can’t see, a concept that has lead marketers to largely ignore dark social until now. Luckily, big brands can use technology to harness and activate their dark social blind spot.